The Bank of England's Monetary Policy Committee (MPC) has split three ways again over interest rates and quantitative easing (QE). Minutes of the MPC's December meeting showed that one of its nine members again wanted QE to be expanded, while another continued his call for interest rates to rise to 0.75% from 0.5%. However, eight MPC members voted for both rates and QE to stay unchanged. 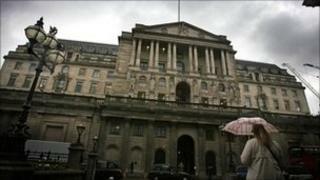 The Bank's key interest rate has been kept at 0.5% since March 2009. In each of the last three monthly MPC meetings, Andrew Sentance has called for rates to rise in order to cool inflation, while his colleague Adam Posen has voted for QE to be expanded. The most recent figures showed that UK inflation - as measured by the consumer prices index (CPI) - rose to 3.3% in November from 3.2% in October, led by food, clothing and furniture price rises. The CPI inflation rate has now remained above the government's 2% target by one percentage point or more for 12 months. QE is the Bank's policy of putting new money into the financial system to try to stimulate the economy. Mr Posen wants an extra £50bn to be added to QE programme. Following Wednesday's downward revision to the growth of the UK economy between January and September, IHS Global Insight analyst Howard Archer said he expected the MPC to keep rates on hold at 0.5% "until at least late-2011 and very possibly into 2012". The Office for National Statistics said UK GDP expanded by 0.7% in the third quarter, down from its earlier estimate of 0.8%. It revised growth in the second quarter to 1.1% from 1.2%, and in the first quarter to 0.3% rather than 0.4%. Mr Archer also highlighted concerns about a further slowdown in economic growth in 2011 as a result of the impact of the government's £85bn spending cuts and VAT rising to 20% on 4 January.